It’s safe to say that when it comes to driving the U.S. economy, few industries have had as great an impact as the commercial truck driving industry. It’s also an industry whose importance, not to mention the importance of the nearly 3.5 million professional truck drivers across the nation – is often, surprisingly overlooked. This past September, American Trucking Association took the time to honor the dedicated men and women responsible for safely transporting more than 70% of the consumer goods (over 10.42 billion tons annually) Americans rely on across the nation. We’re taking a moment to explore the world of our nation’s elite group of road warriors out there keeping the wheels of a global economy turning. The life of a professional truck driver is exactly that – one that involves a lot of moving parts in the literal sense. Not just the parts that make up the big rigs and tractor-trailers you’re driving that have a gross vehicle weight (GVW) capacity of more than 26,000 pounds. 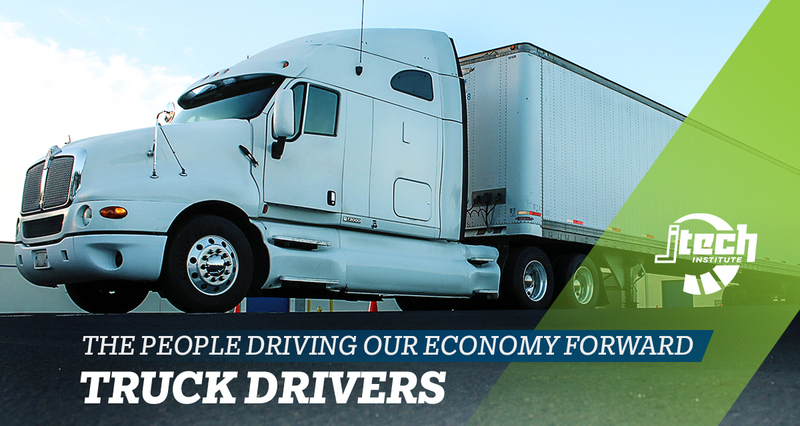 Everything, from the food we eat, the fuel we power our homes, cars and businesses with, to the critical supplies, medical equipment, and even drinking water – is transported to every corner of the country by professional truck drivers. Considering the monumental importance of ensuring all the moving parts that are the essential consumer goods we rely on, get where they need to go; there’s no way to overstate the impact the trucking industry has on the daily lives of Americans. There’s another component to how professional truck drivers affect the nation’s economy. Sure, getting food, medicine and other essentials to millions of Americans is fundamentally important to the country’s overall well-being. The upstream aspect of delivering raw materials and other products that businesses need to operate is a huge part of a thriving economy. An automobile manufacturing plant that employs 300 people is directly impacted by the ability to get engine parts and other key components, delivered to their location in Idaho from the plant that manufactures those parts in Texas. Imagine what would happen to that business and its 300 employees if commercial trucking wasn’t an option. Even without considering the number of people employed in the commercial trucking industry, the industry as a whole has a massive impact on the nation’s financial and economic health. It’s pretty clear that professional truck drivers are important to a thriving economy, but what does life behind the wheel really look like? You can imagine it might take a unique person to take on a lifestyle that keeps you on the road for days or even weeks at a time. Country singer/songwriter, Steve Moakler, already had a pretty good understanding of “road life,” from his 11 years on the road touring with his band and from his grandfather, who owned a concrete trucking company. He got an even closer look at life in the driver’s seat when truck manufacturing giant, Mack Trucks asked him to write a song to pay homage to the hard-working truck drivers out on the highways every day, and for the debut of their new Mack Anthem truck. Moakler’s highway anthem – “Born Ready,” and his personal insights are featured on Mack’s #RoadLife video series and can be viewed at: http://respond.macktrucks.com/RoadLife#/. Working as a professional truck driver can involve spending a lot of time away from home. But there are plenty of reasons that might tip the scales in the direction of choosing a career in the driver’s seat. There’s a shortage of more than 50,000 truck drivers that industry experts predict could rise to as much as 175,000 by the year 2026. Education and training requirements are far less than most industries require. A professional truck driver can complete a training program and obtain a CDL license in a fraction of the time for a fraction of the cost compared to most other professions. Professional truck driver – one who possesses the practical wisdom required to consistently make prudent decisions based on knowledge – gained from experience. An apt description for a profession that has the power to impact a nation on a daily basis. If you’ve always been interested in a career behind the wheel, check out the Commercial Truck Driving program at J-Tech Institute. J-Tech is training the next generation of over the road professionals in their 168,000 square foot training facility in Jacksonville, FL. The 4-week or 8-week program and J-Tech’s dedicated faculty is helping students get the training and skills they need to be ready for the Class A CDL exam. Contact J-Tech today to learn more about a career in professional truck driving. The road is calling – are you ready to answer? You can give us a call at 904-328-5599 for more information.